Tick season is upon us, and during this season, Lyme disease is a real threat to dogs in most areas of the United States. Going for a walk in the woods or even in a field with long grass can mean ticks galore. Lyme disease can only happen if a tick has been attached to your dog for several days at a time, so you want to get to them early. Always do a thorough check of your dog when you get home from walking them or when they come inside from running around outdoors. Also keep in mind that the climate is changing in the United States and around the world. This means that tick season is longer than it ever has been before. It starts earlier in the spring and it lasts later into the fall. In some areas, tick season may last year round. If you find a tick that is not yet attached to your dog and it’s just crawling around, promptly pick it up and dispose of it. If, however, you find a tick that is attached to your dog, be sure that you know the proper way to remove it. You’ll need alcohol, tweezers, a pair of rubber gloves, and a plastic bag. You also might want someone to help you move the fur away from the area so that you can have a better view of what you’re doing. Put the gloves on, and use the tweezers to grasp the tick as far down toward your dog’s skin as you can. Do not squeeze or twist because you want to pull the head out with the body. Gently pull in a perpendicular motion away from your dog’s skin. Disinfect the area with alcohol after removal. Keep the tick inside the plastic bag in a safe area of your freezer so that you can bring it to your vet if you notice signs or symptoms of Lyme disease. 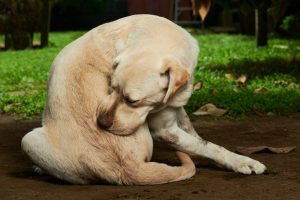 Are you having trouble with fleas and ticks on your pets? We offer many types of treatments to help keep these bugs away and prevent disease from their bites! Make an appointment to come visit us at Cypress Animal Hospital today!